Earlier this week we had the top 2 teams in the 6A show down in Allen with Martin and tonight we will have the top 2 teams in the 5A showdown in Amarillo being held @ Canyon Randall High School. 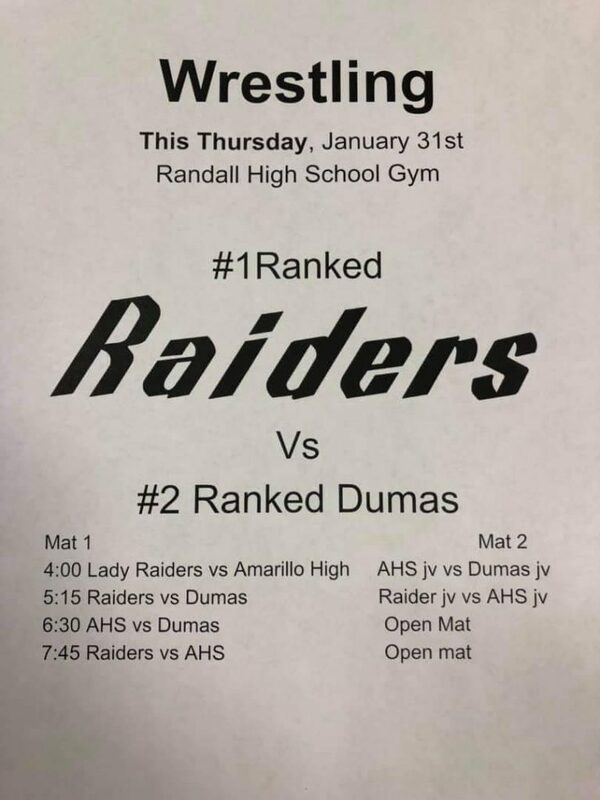 The Wrestlingtexas rankings have Canyon Randall with the #1 team ranking followed by Dumas at #2, Amarillo High comes in at #5. The Regional Coaches Rankings for region 1-5A however have Canyon Randall #1 with #2 being Amarillo High and Dumas coming in at #3. So by the end of tonight we will see who has the best Region 1 5A boys team as every weight class has a top 20 ranked wrestler.